In law school I served as Managing Editor of the Morningside Muckraker in part because I would get to work with creative people. I'm not artistically creative myself, but I like being around people who are, discussing their work with them, and helping to create spaces where they can be their creative selves. 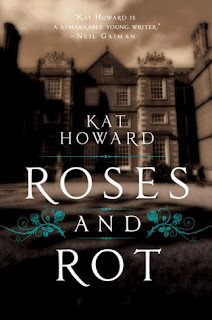 Kat Howard's debut novel "Roses and Rot" evoked this feeling of being around those who live to create. And it gets bonus points for reminding me of excellent parts of "The Night Circus." Imogen and Marin are sisters, a writer and a dancer, respectively. They grew up together and grew extremely close as they were forced to deal with horrific abuse at the hands of their mother. And yet, at the start of the novel, they haven't spoken in seven years, though they are about to live together in an artist's colony, Melete. Everything at Melete is not what it seems. Imogen and Marin must decide what their art means to them, what are the aims of their ambitions, and what they will sacrifice to achieve their goals. Howard creates an enchanting environment in Melete, and it is this setting and the feeling created that reminds me of "The Night Circus." Make no mistake, the books are entirely different, but each has its own carefully crafted atmosphere that draws the reader in an ensnares their attention. Additionally, each character has a slightly different view on art and how to create, though all share a devotion to their work. I enjoyed the opportunity to consider these different approaches. Finally, Howard is playing with fairy tales. Imogen writes them, the girls are living one, and the novel plays with the structures and tropes of them. I have some thoughts on how this plays out, so get to reading so we can discuss. Verdict: Affirmed. "Roses and Rot" is great on audio and ebook (as I learned when my audio rental expired and my aunt generously provided me with the ebook to finish the last several chapters; thank you again!). Fans of fairy tale retellings and inspired works will appreciate this new entry in the subgenre, and sisters will enjoy the complex and true relationship between Marin and Imogen. "Roses and Rot" by Kat Howard, published May 17, 2016 by Saga Press.